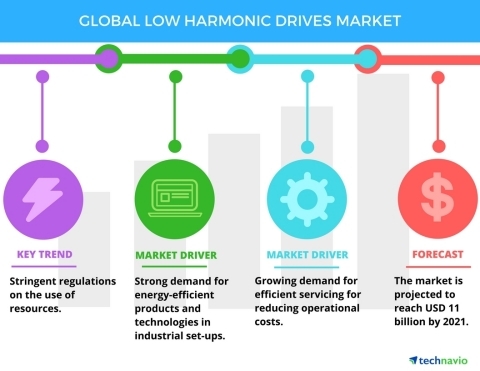 Technavio’s latest market research report on the global low harmonic drives market provides an analysis on the most important trends expected to impact the market outlook from 2017-2021. Technavio defines an emerging trend as a factor that has the potential to significantly impact the market and contribute to its growth or decline. The American Council for Renewable Energy has underlined the objective of 50% of energy consumed in the industrial sector to be renewable by 2050. Similarly, the European Union plans on meeting this target of 50% of renewable energy utilization in its industries by 2040. These stringent rules and regulations are directing industries towards the efficient use of resources and investment in waste management. The European Commission has imposed stringent regulations on industries to abide to the energy standards. For instance, as per the European Union Guidelines, from January 2017 onward, all motors having an output from 0.75 kW to 375 kW should have a minimum IE3 level or IE2 level with a variable speed drive. The development of IoT and technological enhancements have increased the adoption of automated technologies in industries. Vendors are offering consolidated offers such as control modules and services through smart devices and wireless connectivity technology for industrial equipment. In addition, vendors have started developing apps for their electric drives by providing real-time information on their performance and service requirements. Continuous storage and retrieval of critical working data of drives and motors through cloud computing as well as product information sharing and comparison can also be done easily and promptly with the help of IoT. “Rapid advances in technology are driving vendors to develop next-generation drives to meet the demands of end-users. For instance, Siemens has developed drives with advanced network connections due to the growing need for compact drives with higher efficiency,” says Bharath. Low harmonic drives are usually large and require a lot of space. SMEs and small-scale industries have space restriction, as a result of which SMEs usually install 6-pulse variable frequency drives. However, these drives are prone to get affected by harmonics distortion, in turn affecting the equipment in small industries. Therefore, building a compact low harmonic drive along with a regenerative drive can solve the problems of small-scale industries. Regenerative energy drives are compact drives with low harmonic drives that can help in providing the energy back to building's power grids. Therefore, regenerative energy drives help in increasing power efficiently and effectively in plants.